Perhaps the only thing Santa loves more than delivering presents is…you guessed it, eating cookies. So when a cookie is left on a plate for Santa on Christmas Eve, the odds are he’s going to eat it. 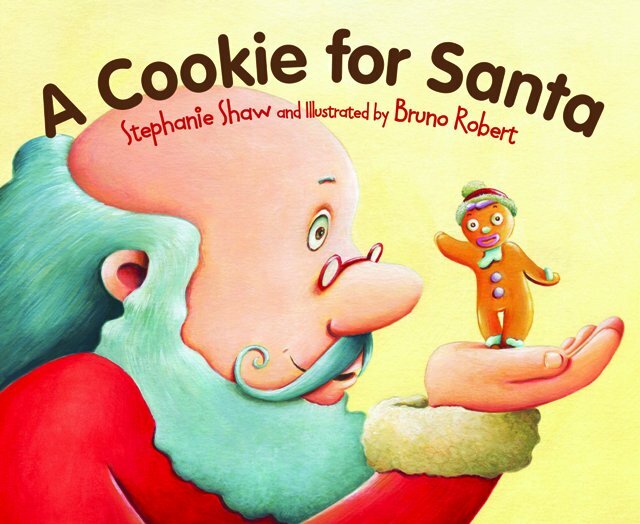 In author Stephanie Shaw’s latest picture book called A Cookie for Santa, this is the dilemma that the perky, newly-baked Gingerbread Boy faces on Christmas Eve. As he reclines on his plate, gazes at a delicious glass of milk and contemplates his dismal fate, he realizes he has a Christmas Eve duty to be eaten. And yet this Gingerbread Boy wants to live! While he ponders whether he’ll be brave or “a crumbling coward” when Santa gets there, two of the family’s rambunctious puppies begin to tear Christmas paper, play tug-of-war, and leave the room in a horrible mess. It’s up to the Gingerbread Boy to figure out how to distract them long enough to stop the mayhem, and he does just that. What he doesn’t know is that Santa just might have room on his staff for someone as clever as he! A Cookie for Santa is another in a long line of sweet Christmas picture books with a delightful twist for the very young. It’s written in rhyme that mimics “The Night Before Christmas,” and the brief and age-appropriate sentences will bring a smile to the face of readers and listeners alike. Great for reading around the fireplace after baking sugar cookies with the family, and also great for building your elementary students’ anticipation about the upcoming holiday. Next articleMake Art With Your Hands and Feet!